After the guerrillas have taken control of the Ke'yra sector they started working fast in securing the place in order to transform this sector into their HQ as until now they were scattered all around the solar system but for the first time they have the opportunity to settle in one place, a place on the outskirts of the solar system, where they can easily spot any incoming enemy fleet. As part of their efforts to establish a defensive perimeter they built what they call "Junker Trade Lanes" and fitted them with missile-based defensive systems. 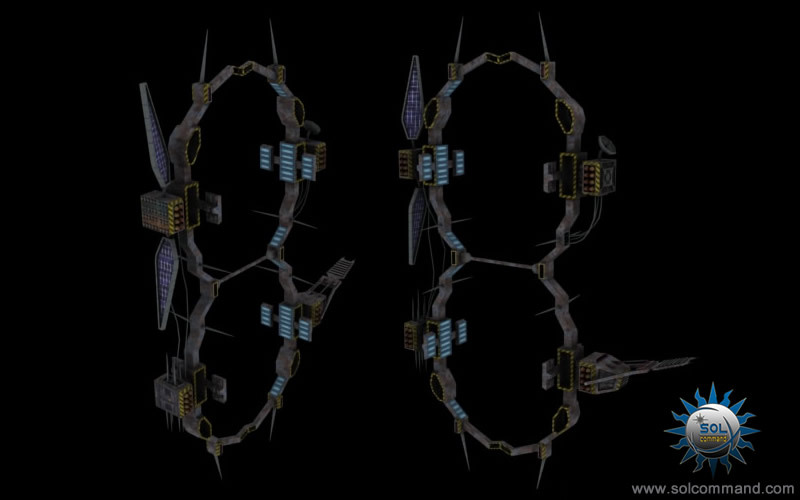 Basically these devices act like acceleration gates, "throwing" a ship in a certain direction at huge speeds .... perfect for fast deployment of ships on the battlefield. This type of acceleration gate is powered by solar panels and a device that captures the residual heat and gas from the engines of passing ships and converts this into energy. Guess the ingenuity of the guerrilla scientists knows no limits when it comes to converting junk from the scrap yard in to cutting edge technological devices.